Sean Dyche admits Burnley are still searching for that killer instinct as they look to maintain their superb start to the season against Huddersfield Town at Turf Moor tomorrow. The Clarets have only lost once in their opening five Premier League fixtures to climb to seventh place in the table. And they are unbeaten away from home, despite a tough schedule, with trips to three of last season’s top four, in champions Chelsea, Tottenham Hotspur and Liverpool. They exited the Carabao Cup on penalties on Tuesday night, however, at home to Championship leaders Leeds United, despite having enough chances to put the game to bed in normal time. 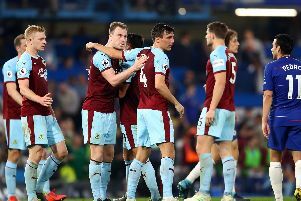 And Dyche feels that is where his side are still growing: “There’s never the lack of will and demand here, to go all the way down the line, so I was really pleased with that. “The only gripe is the amount of opportunities we had, and not just the opportunities, the actual chances, but getting in the other areas to find that final moment. “I think that’s where we’re still shifting forward, working with the group, that final moment of real quality. “That’s often the case when you look up the ladder in the Premier League, those players find that final moment. “We had enough moments to be in the right areas. Dyche will check on forward Jon Walters before the visit of the Terriers, after he missed the cup clash with a knee injury, while striker Nahki Wells, signed from Town on deadline day, will again miss out as he steps up his fitness after surgery to remove a pin from his ankle. But he is pleased with the options available to him, after making seven changes against Leeds: “I made it clear before the game, we took it seriously, you could tell that, the big thing is we have a group who got good minutes in their legs, and with the extra time, it’s a real fitness top up. “You can have all the practice games you want, it’s not the same as playing out there. “A lot is made of the cup, but it’s a quiet night compared to a Premier League game, you can feel it in the atmosphere, and I felt we had to bring that on ourselves as a group, and they attempted to do that, the crowd came to life and it brings the cup tie to life. Phil Bardsley impressed, and Dyche also singled out Ashley Westwood, Charlie Taylor and his centre backs for praise: “I said it would take a bit of time with Bardo, but there were some good performances again. “Westy was excellent, Tarky (James Tarkowski) and Longy (Kevin Long) solid, Charlie did well but fatigued at the end.